Well opening weekend turned out to be too warm and enough wind to last a lifetime. We did skate by with just a few sprinkles and felt lucky there at least. Me and my daughter were the only 2 people who did not see deer opening day. Plenty of time in the tower but nothing except for a couple of turkeys passed our way. A friend of my brothers shot a nice 7 point buck on Saturday. Everything else taken in the hunting party was a doe. Sunday, had it not been for a fleeting glimpse of a doe my brother ran out, me and the daughter still would not have seen anything. Finally, Sunday evening, the wind calmed and the last 45 minutes of the day were perfect except, STILL SAW NOTHING. By 8pm Sunday, there was frost on the ground but overnight it clouded over and warmed back up a bit. So monday morning was seemed very promising. I made a short walk to the north of my tower and had my daughter sit and watch. As I headed back her way I pushed a nice doe out in front of her. I heard her shoot and heard a deer do a crash landing to the south of me. I waited a few minutes and cut cross country back to her at the tower. She was excited to say the least. This was the first time she had ever even taken a shot at a deer. But she seemed very confident that she had connected. We gave it a couple more minutes and headed to the location where the deer had been standing. It didn't take long before we spotted blood and started following the trail. The doe had made it 75 to 100 yards up hill and over a fence before dropping. Shot placement was great and the Ruger Stainless 243 once again did the job quite well. The deer had paused more or less broad side but quartering slightly. The shot entered the shoulder and exited breaking a rib. The second weekend it was at least colder but I still wasn't seeing any deer. 4 deer were taken Saturday by others in the party. 2 of them had been taken on the south farm. So, Sunday morning I went with them to the south farm. NOTHING, well, that's not quite true, we did see one moving about 30 mph at 700 plus yards. Not sure that even counts as a "sighting." We headed back to camp for a sandwich and about 11:00AM I headed for my tower once again. I took my Ruger Compact 308 and my Ruger Stainless 243. My brother and his friend were going to try a short drive toward my stand after I got situated. I sat down, got my gloves and ear muffs on and a nice 8 point buck jumped the fence onto our property not 75 yards from me. I grabbed the closest rifle which was the Ruger Compact. 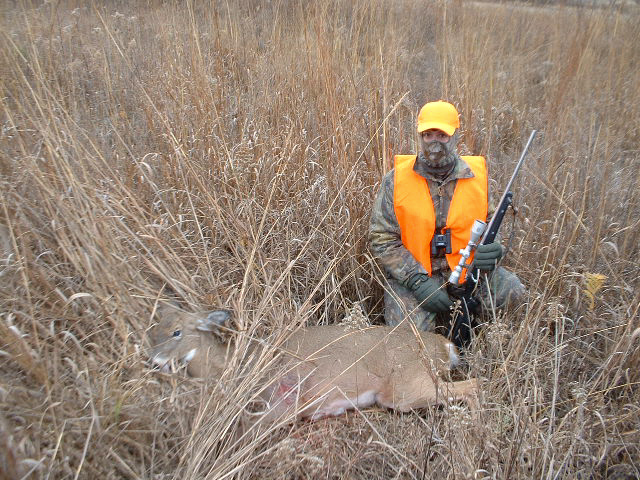 He didn't waste anytime as he headed across the CRP ground. I tried to stop him with a whistle but had a mouthful of chew and it turned out more like a spit then a whistle. I took the shot anyway and down he went right on the spot. He had made it to about 125 yards from me. I called my brother on the radio and told him to "forget the drive and bring rope." When we got to the deer of course you want to know where you hit him. Well, there was a nasty looking hole across the top of the tenderloins. A quick glance at that and we knew it was an old wound and not my shot. Couldn't find a hole anywhere that would explain his demise. We knew we'd figure it out in time so we loaded him up and took him back to camp. They had 4 deer hanging in the tree and were planning to quarter them out. My brother said if I wanted to go ahead and hunt that they would hang my deer for me when they finished. I decided to try my brothers tower. He had been seeing deer all weekend. So I dug out my Remington 700 243 and headed off to see if my luck would hold. I hadn't carried the Remington for a couple of years now and felt sorry for it. Before they left camp, my brother called me on the radio and told me that when they hung my deer, they ran the slit on up the neck a ways and found my bullet hole. Got him low in the neck, another inch lower and I would have missed completely. I don't know how I did that but I'll take it. 2:30 PM, they wished me luck over the radio and drove off. 3:15 I glanced over my left shoulder and spotted a deer at one of the ponds. It was a doe and she was about 200 yards out. I took my time, cranked the scope up and stuck the muzzle over the wall of the tower. The shot landed a little lower than expected but she only made it about 100 feet before dropping. 2 hours later I had the camper empty, the truck loaded and was headed for home. I spent roughly 35 hours in the field and ended up killing 2 deer in about 4 hours. Go figure ! 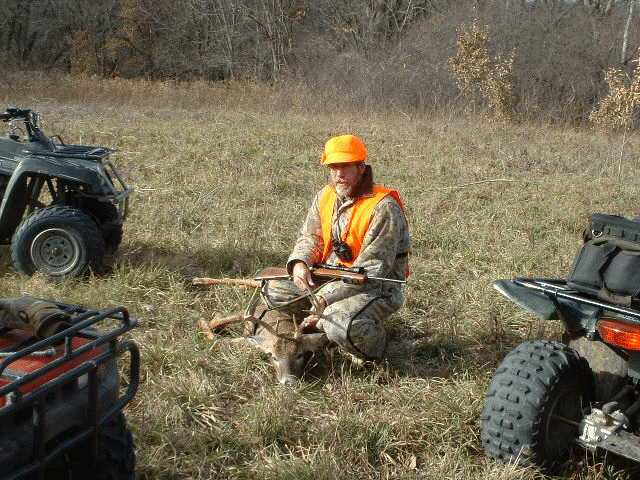 All together we took 12 deer off 260 acres and just guessing, another 2 dozen were seen. During the season, I carried my old Savage Hornet but never got a shot with it. I carried the Ruger Compact, a lot and I have come to the conclusion that my next rifle will be another Ruger Compact. This time, I will buy a 243. Nothing against the .308 really except for recoil at the target range. I have killed 4 deer with it and cartridge performance has been very impressive. I always use 100 grain bullets in the .243 and have had excellent performance with that combo. When I buy a Compact in .243, I know that I will lose about 75 feet per second with the shorter barrel. I'm thinking that switching to a 90 grain bullet will compensate for that but I am also confident that no compensation is really needed. The .243 with a 100 grain from the compact would do the job quite well but, that's why I reload, because it gives me options. I can shoot whatever I want to try. We still have the December extension to take "anterless only" deer so we will see how that goes.